Your face shape has a huge effect on which jewelry matches you best. You might be surprised to learn that your facial structure actually has a strong effect on how you look with certain kinds of jewelry. The right earrings or necklace can complement your best features, while the wrong jewelry can exaggerate your look or draw too much attention to certain areas of your face. Before you start trying to figure out which kind of jewelry is best for you, you’ll want to determine what kind of face shape you have. 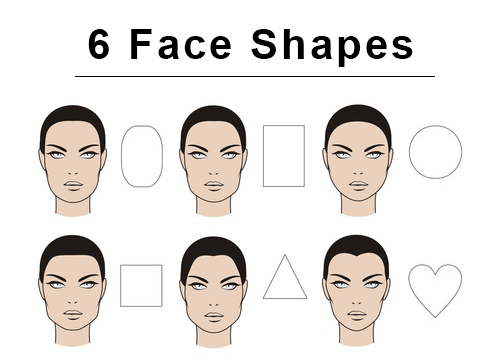 Most faces can be categorized into 6 general shapes: Oval, Round, Square, Rectangle, Triangle, or Heart. While some can tell just by looking in the mirror, you might want to research and measure a bit just to make sure. Alternatively, you can do a quick search of celebrity face shapes and see who matches you the most. After you know your face shape, you can learn which earrings and necklaces will work best. While it’s true that oval faces tend to look great with a wide variety of jewelry, there are still some things to keep in mind. An oval face is a bit longer than wide, so it’s a good idea to avoid earrings that are too long. 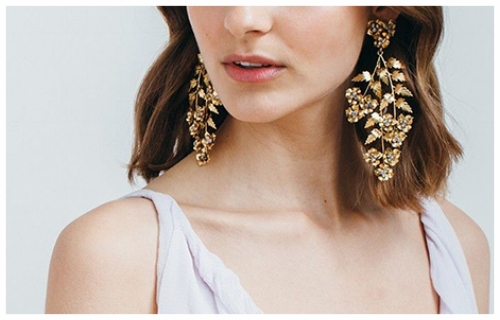 Shorter earrings give a more balanced look, and don’t overemphasize the long face shape. In the same way, shorter necklaces are also a good bet, such as collars that don’t fall below the shoulders. If you want to try an interesting look, go for earrings that “crawl” up the ear, or earrings with shapes that point upwards. For round faces your main objective is to avoid jewelry that makes your face wider. 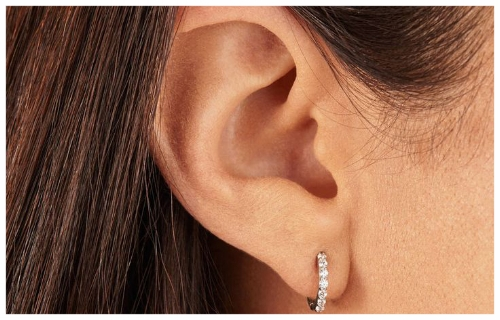 This means circular earrings are a no-go; opt instead for teardrop or more narrow shaped earrings. As for necklaces, aim for long, V-shaped necklaces for a balanced look. 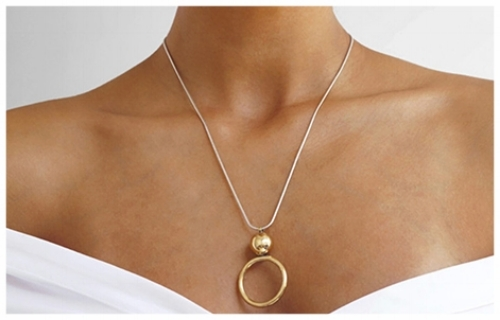 Necklaces worn above the collarbone can exaggerate the round shape, so keep this in mind when choosing your new jewelry. Aside from this, make sure your jewelry has curves and flowing shapes to create a softer look. Hoop earrings are great, as well as pendants in a curved shape. Also called an “oblong” face, this shape shares some similarities with the square face. You’ll want to aim for jewelry with a lot of curves, crescents and other round shapes to create a softer look (although “hoop” earrings and large round jewelry may not work as well). However, the other main objective with a rectangular face is to make it appear wider. 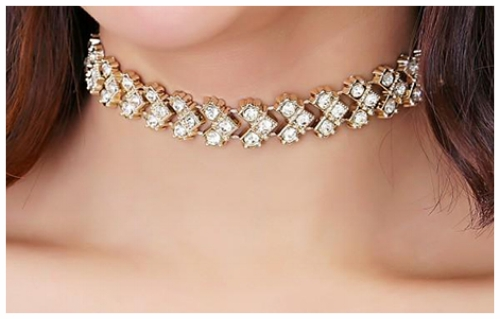 Aim for collar and choker necklaces, as these look great with this face shape! For a triangular face, you’ll want to put less emphasis on the jawline, while making the forehead appear wider. Aim for matinee and princess length necklaces to give the face a longer look; a striking pendant can also help with visual harmony. 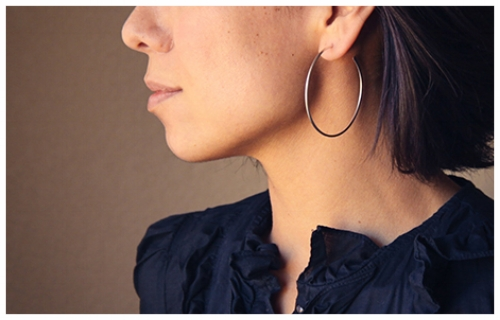 Hoop earrings look great on this face shape, as well as longer earrings with curved shapes to soften the jawline. This face is marked by a wide forehead and narrow chin. Both wide earrings and short necklaces flatter this shape and help the jawline appear more balanced. Chandelier earrings are one of the best choices for this face shape. Triangular earrings also help balance this face. It can be a good idea to have an eye-catching pendant on your necklace, in order to make the face shape appear more symmetrical. It's important to keep in mind that some people can be a combination of different face shapes, and the categories "round" or "triangular" might not perfectly match their unique facial features. You also might be interested to learn that some scientists believe there are actually nine face shapes in total, not only these six. While these general guidelines can be a great start, only you know what jewelry you look best in. If you think you look great in a pair of earrings not recommended here, then by all means keep wearing it! Everyone has their own unique look and it’s important to honor your individual expression.